Barry M are by far my most-bought nail polish brand, I absolutely love the huge range of shades and finishes, not to mention the awesome quality for a super-affordable price. When I heard that some new Matte Nail Paints were being released for Summer 2014, I was pretty much queuing up outside Superdrug - I really love matte nails, and the Matte Nail Paints I've tried from Barry M have been really lovely. There are also two Limited Edition (non-matte) shades released in Superdrug at £3.99 each, with a special offer of getting one free when you spend over £6 on other Barry M products - bargain! 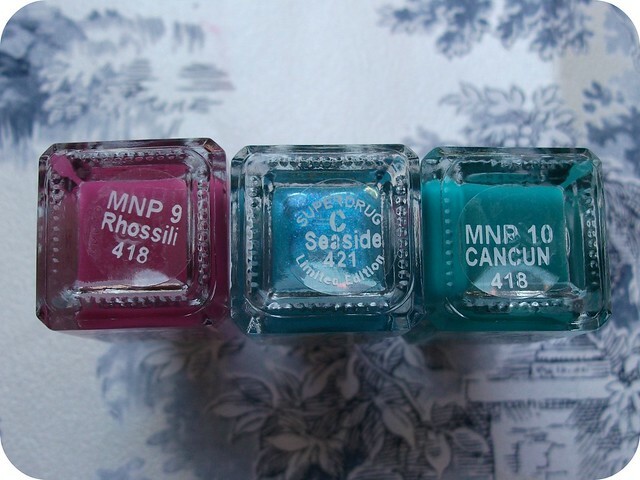 (L-R: 'Rhossili', 'Seaside' and 'Cancun') I haven't worn my new polishes yet (due to not being allowed my nails painted at work, sob!) but I'll have a couple of NOTDs up in the coming week or two to show you how they look on the nails. I've currently got 'Seaside' on my toes but there are no feet allowed on my blog so you'll just have to hang on to see how it looks! I will say it's a lovely bright, shimmery shade which really puts me in the mood for a day at the beach. Have you picked up any of the new Matte Nail Paints yet? Which shades have caught your eye? Are you a sucker for a Limited Edition polish like I am!? I feel for you girl! hang in there!!! curious to see how these look on you!! I LOVE matte things! So will definitely be purchasing a few of these! These are all gorgeous - Barry M are my favourites too, but I dont have any of these ... yet! I'm always a sucker for LE! Wish we have Barry M here in the US :(. These new shades are gorgeous! I really like Rhossili, what a weird name that is! Cancun might be my favorite! I've never heard of the brand but the colors are gorgeous.